Plastic is something we deal with at almost every moment of our lives. From our household goods, to our cars, computers, Amazon packages and more, plastic is a seldom-appreciated phenomenon of the modern human age. A miracle of modern chemistry, plastic is arguably the most versatile material out there. However, our use of plastic in today's world exemplifies one of our greatest weaknesses, actually raised out of one of our greatest strengths: we can make the world and its resources bow to our needs, but we often fail to attend to the needs of the world. This behaviour has put a whole host of parties at risk- from the earth itself, to our co-habitants, to our very own future generations of humankind. The most prominent example of such behaviour, and rightly so, is the phenomenon of pollution. Air pollution scars the lives of many inhabitants of today's sprawling metropoles of the world, while putting the very future of our entire Earth at risk. Though a known concern for many years, the way we use plastic has come under the spotlight in recent months. The primary issue with plastic comes with its lack of biodegradability; meaning, left undealt with in landfill or in oceans as it is in many places today, it will not go away. Plastic waste will simply pile up. And boy, has it been piling up. 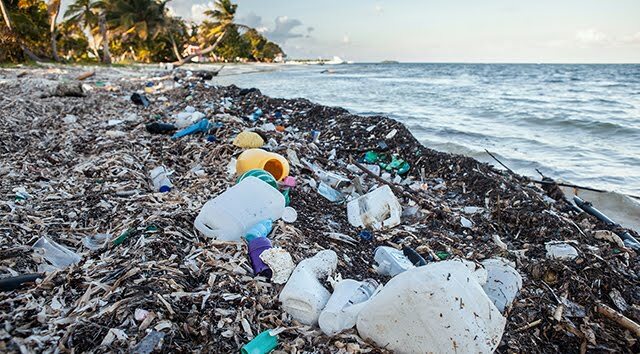 We produce over 300 million tonnes of plastic each year; 8 million tonnes of which is dumped into the ocean, according to plasticoceans.org. At the current rate, it is estimated that by 2050 the plastic waste in our seas will outweigh all the fish. Yes, an increasing amount of waste plastic is now being recycled; but still, a shocking 91% of plastic worldwide isn't recycled. This is usually due to one of two reasons; poor recycling infrastructure and organisation, or the lack of recyclability of many plastics, such as those used in most coffee cups, due to its waterproof nature. We may be encouraged to place our coffee cups in recycling bins, but in reality, just 1 in 400 coffee cups are actually recycled. As one would expect, this massive influx of plastic waste has has profoundly negative effects on the environment and wildlife. 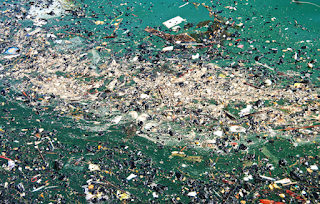 The Great Pacific Garbage Patch (GPGP) is one gargantuan example of our failure to deal with our excess plastic. 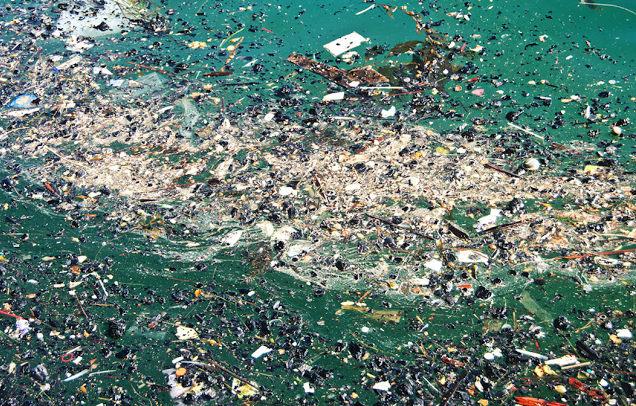 The GPGP is a massive collection of debris, the majority of which consists of plastic. While we tend to imagine this as a mass of plastic bottles and the like drifting in the sea (as pictured on the right), the majority of the GPGP is made of 'microplastics'. While plastics do not biodegrade, they are broken into smaller and smaller pieces continuously. This results in a dust-like material that never disappears from the oceans. Microplastics also come from everyday items we use. For example, it was very common for many skincare products and toothpastes to contain microbeads, that supposedly improved the feel of the product on the skin and visual appeal. However, research suggests that microbeads blocked digestive tracts of animals who consumed them- so these luxuries came at an exceedingly high price. On a positive note, more people are coming to realisation about this, as bans on the use of these materials come into play in many countries of the world. This waste in the oceans wreaks havoc with wildlife. Unaware of the dangers and toxicity of many plastics, small pieces of plastic are often confused with food. A 2015 study found that as many as 9 out of 10 sea birds had plastic in their guts. There are countless further tragic stories of animals falling victim to our plastic waste. From poisoning to asphyxiation, plastics are the causes of death for estimated millions of animals, both on land and in sea. Whether they are in the form of microbeads, plastic bags, packaging or something else, plastics pose a significant threat to biodiversity, and in the long term could threaten entire species if left undealt with. Our success in making plastic serve so many of our needs is coming at the cost of our planet. As our land and seas become landfill sites for plastic waste that will never go away, millions of animals are dying, suffering from pains as simple as becoming entangled in plastic six-pack can packaging. Plastic has indeed served the human race well- but it is time to move on. So, how can we confront this massive problem of plastic, when we are so dependent on it? We'll discuss what governments, businesses, and we as individuals, are doing and can do to end this chaos in next week's article. To see how you can influence and get involved in the fight against plastic, join the community at A Plastic Planet.